Gotta Go Fast: The Velox was designed to be a quick and maneuverable support ship to larger Ascendancy warships, able to be moved to any position in battle and remain a flexible asset. Squishy: While it may be fast, the Velox won't last long under sustained and concentrated enemy fire. 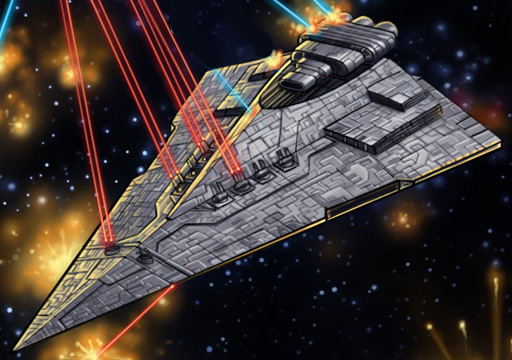 The philosophy of the Sith Ascendancy revolved around the idea of martial strength, which led to the initial creation of large warships and battlecruisers. The idea of smaller more maneuverable ships was almost an afterthought, but it was eventually conceded that such ships were an integral part of any fleet composition. Thus the Shipwright Corps quickly began conceptualization and construction of a new brand of warship to act as the mucilage between the already existing larger starships. That brand was the Velox-class Fast Frigate, a four hundred meter long vessel capable of achieving fast speeds relatively quickly and making tight maneuvers on the fly. However, the ship was lightly armored and lightly armed but was allowed the accompaniment of a single starfighter squadron in its small ventral hangar bay. Besides acting as a support ship for larger Ascendancy fleets, the Velox has also been known to serve as a patrol ship for territories both newly conquered and long since integrated. Edited by Zef Halo, 02 May 2018 - 10:41 AM.